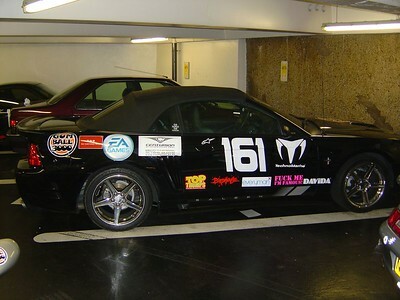 Photos of our participation in the 2004 Gumball 3000 Rally. 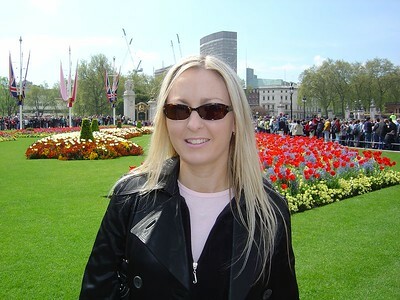 Me in Trafalgar Square in London. It's a little like Times Square in NYC. 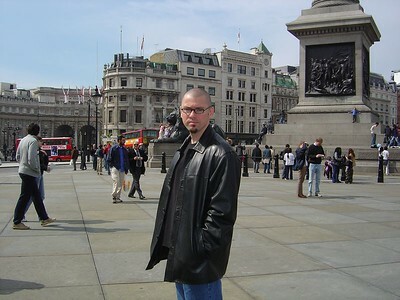 Rob in Trafalgar Square. Notice the double-decker buses behind him. A shot of Big Ben from Trafalgar Square. 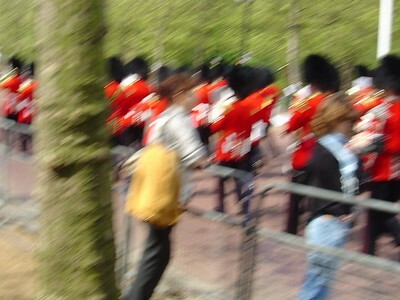 A blurry photo of the parading soldiers marching to Buckingham Palace. We were running to catch up to them. 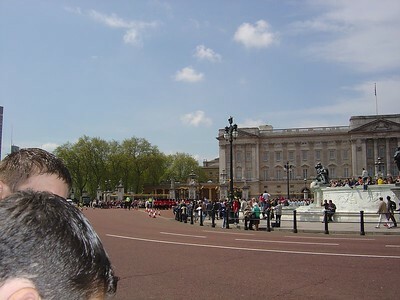 Me in front of the gardens at the Palace. 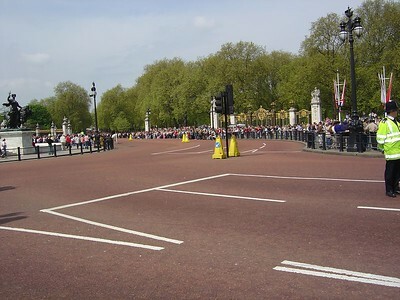 You can see all the people lined up waiting to see the soldiers parading by. The soldiers are entering the paddock at the Palace. 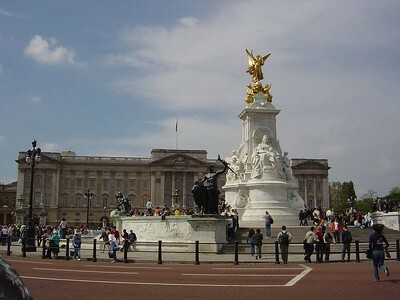 Another shot of the Palace. All the people lined up. You can see a bobby there on the right. 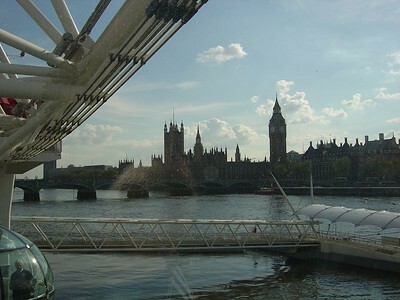 It was the first sunny day they had in London in a while. It had been raining non-stop before we arrived. It was cool and clear today, though. 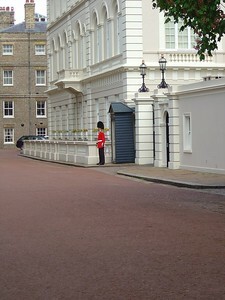 A lone guard at one of the buildings on the main street leading to the Palace. That was as close as I could get due to safety barricades. 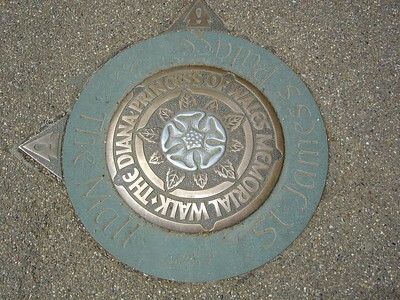 A memorial on the street for Diana. 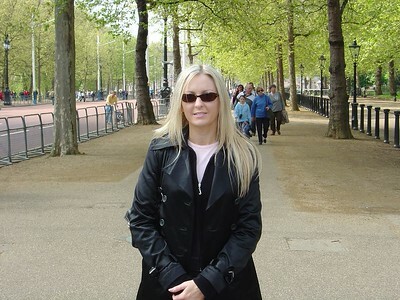 Me on the mall right in front of the memorial plaque for Diana which is on the actual sidewalk. 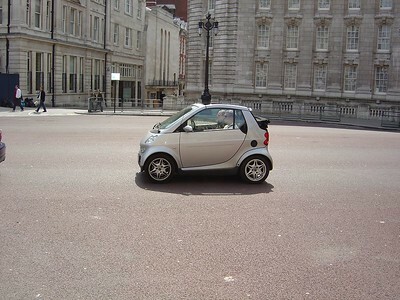 The first SmartCar we saw. 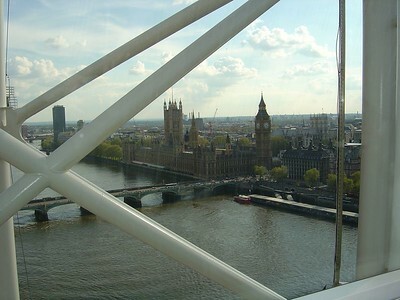 We are taking this picture from the London Eye which is a huge ferris wheel. You can see one of the capsules on the bottom left of the picture. 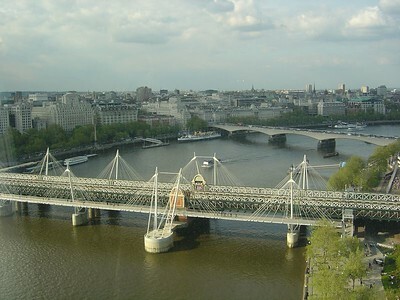 A shot of the Thames River from the eye. 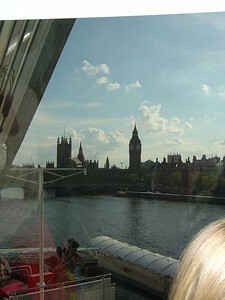 The shadow of Big Ben in the distance. 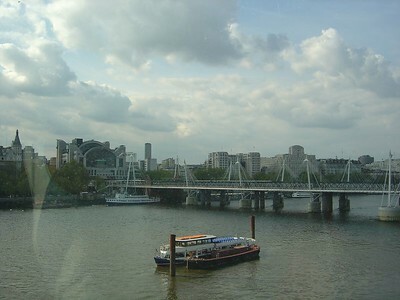 A beautiful view of London and the Thames River. 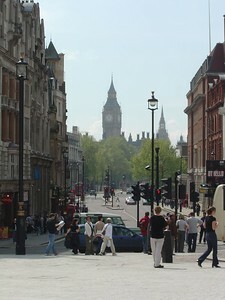 There is Big Ben and the Parliament building. I know, but we had to. She was so cute. It made us miss Lexie. The very kind girl wanted to take two to be safe. 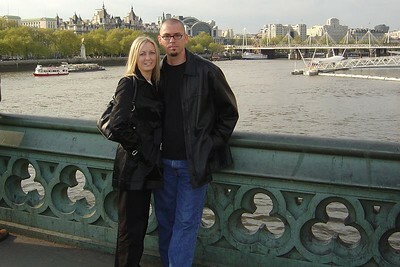 We don't look too shabby for having been up now 30 hours straight and taken a 9 hour transatlantic flight. I think this was called St. James garden. 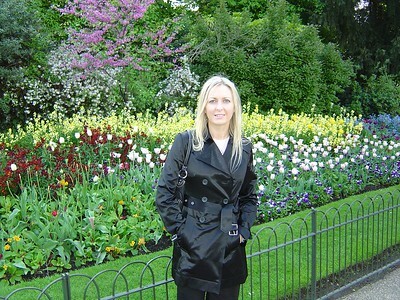 It was a huge park with beautiful flowers and such green grass. 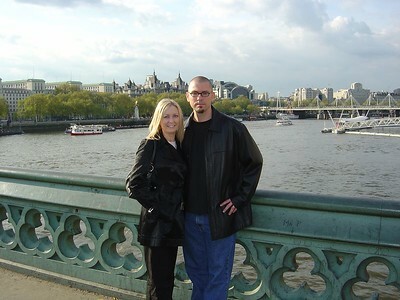 Here we are at the Savoy, where we stayed, with Peter, bellhop extraordinaire. He watched over the car for us. 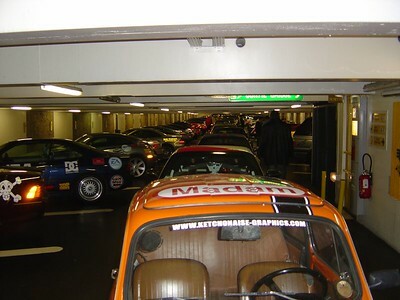 We met our first fellow Gumballers on the Chunnel. 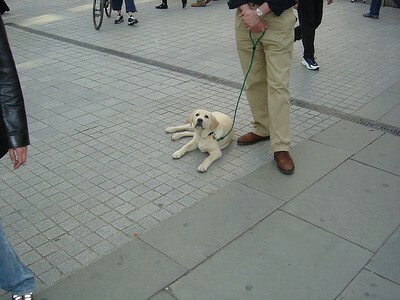 One in particular was Tarquin. He was very nice and, being a veteran, gave us some advice. 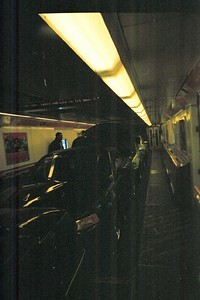 Here we are in the Chunnel going from the UK to France. It only took 35 minutes. 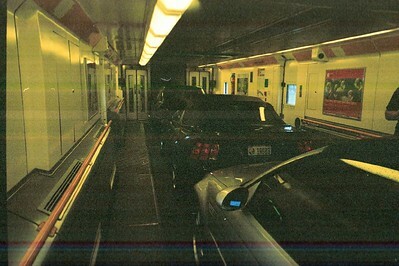 The car was pretty dirty since it rained the whole way to the chunnel from London. It rained the day we left Paris as well so there was no way to clean the car traditionally. 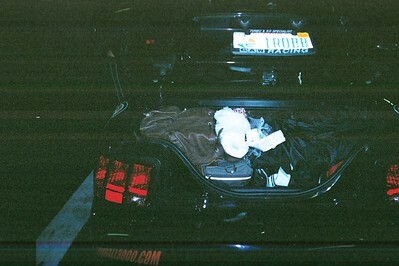 So James helped Rob clean it all by hand and towel. It came out great. 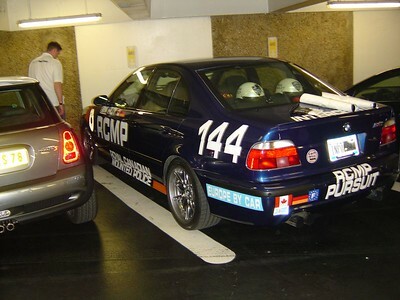 An unintentional cool pic of the car down in the garage pre-stickering. All the cars in the garage pre-stickering. 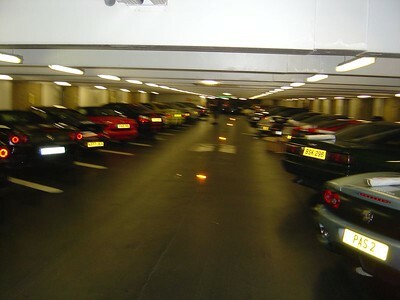 A blurry pic (sorry) of more of the cars. She and we are a long, long way from home. 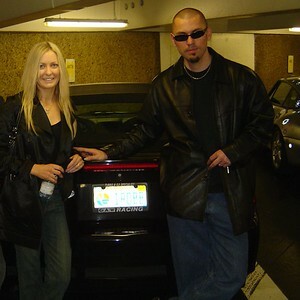 Alex and Amanda's "police" car. 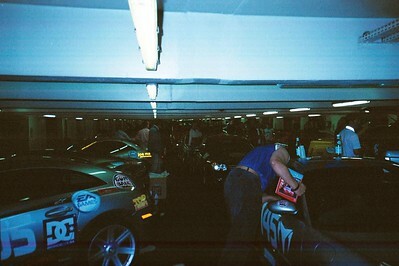 The guys in white are Gumball crew members. The stickering has begun. The rain showed no sign of clearing. It was fairly cold, too. Not what I pidtured when I thought of spring time in Paris. Lined up and getting ready to go. A car we'd never seen before. 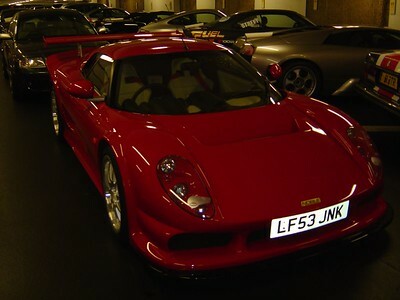 It's a Noble, made in the UK with a Ford engine. It's a beauty. 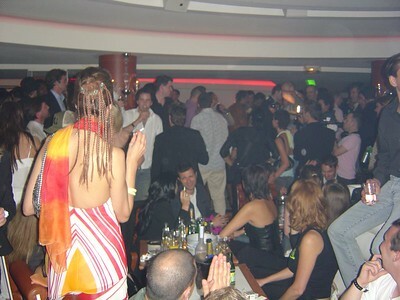 The party the night before at La Suite across from our hotel. We had a great time. All stickered up and ready to run. Julian is a French actor. He drives a Dino, and we tried to persuade him to follow us in the rally but he could not go. 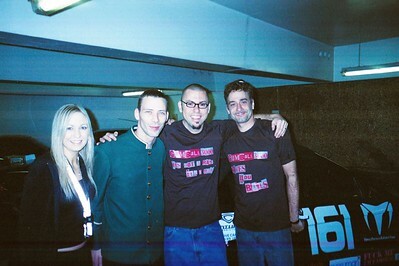 Here we are with Julian. He was our French ambassador so to speak. He ordered for me at the Italian restaurant when my language book did not have the phrase "on the side." He is one of the nicest people I have ever met. 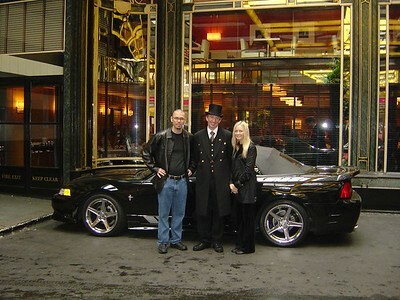 Us with David, the bellhop at the Prince Des Galles. He was the first person we spoke to at the hotel, and when he spoke English right away we wanted to hug him. He watched the car for us and gave us inexpensive restaurant recommendations. 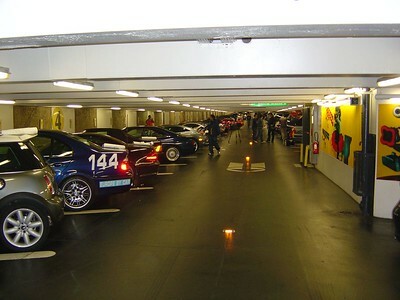 Everyone in the garage in Paris prior to the start packing and making last minute adjustments. Our friend Mike's yellow SSR always drew quite a crowd. It had over 650 horsepower. The retractable top was very cool, too. 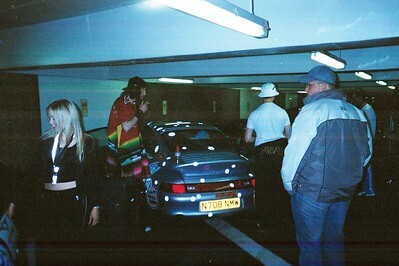 Our friends, RockStar (in the poncho, his band is Mogul) and Tom, get ready to go in their starburst and flower dotted Porsche Turbo. I told them their car was cute.